Yanko Design: "Rock While You Roll"
Get Addicted: "Handcrafted Radio is Connecting to Radio Stations it Passes Over"
Muze was inspired by vehicles of travel. I found it intriguing that people pair most types of travel with music; a way to set a mood and heighten your sense within different environments. I was inspired by longboarding because it focuses heavily on the relationship between the ground, the board, and the rider. 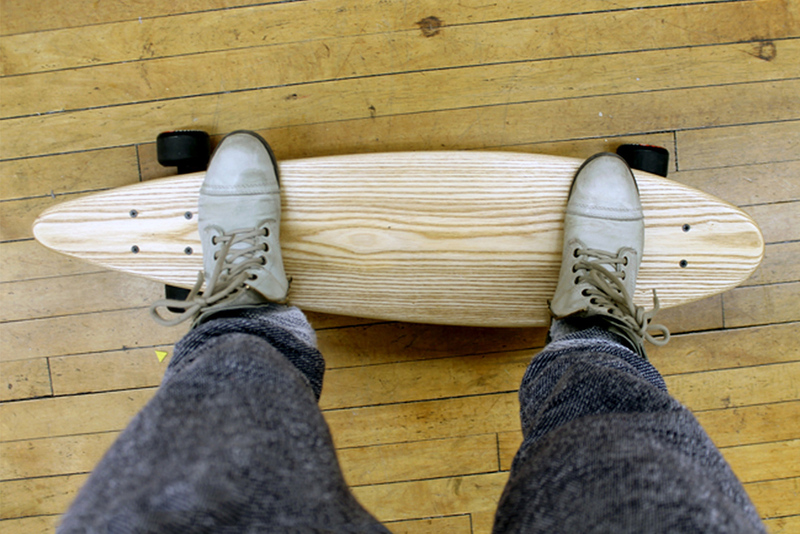 Using a longboard as a method of travel ( to get from point A to point B) can be exhausting, loud, relaxing, and exhilarating depending on where you are. Muze takes that concept of the personal relationship between the rider, the board, and the environment and translates it into music. Based on the environment it passes over the board will skip to different radio stations that relate to the mood. For example, if you're riding over asphalt you'll be listening to Rock but if you're riding on a side walk you be listening to the Top Hits. The volume will also change based on the speed at which you ride. The faster you go the volume will accommodate the excitement of speed and heighten the sensory experience. Arduino Uno, Sparkfun Color Sensor, Reed switch, Magnet // Take a look at the code HERE! Watch students and professors test the radio at our Experimental Form Show below. Exploration of different interaction associations: How sound is materialized.